The Times: Where can I buy a used mattress? You may find a good secondhand one for nothing in a local Freecycle group (freecycle.org). You can advertise for a “want” or browse to see what’s on offer. I gave away a good mattress that way. Some people even offer to deliver. To decorate the cafe when Mr Snelling’s team moved into the 142 Deptford High Street site, pallets found in Resolution Way were stripped down and used for a counter, paint was sourced from Freecycle and a free sofa picked up from Southend. 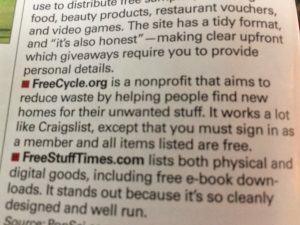 She used Freecycle – the online recycling network where people offer unwanted goods for free with the aim of keeping them out of landfill. 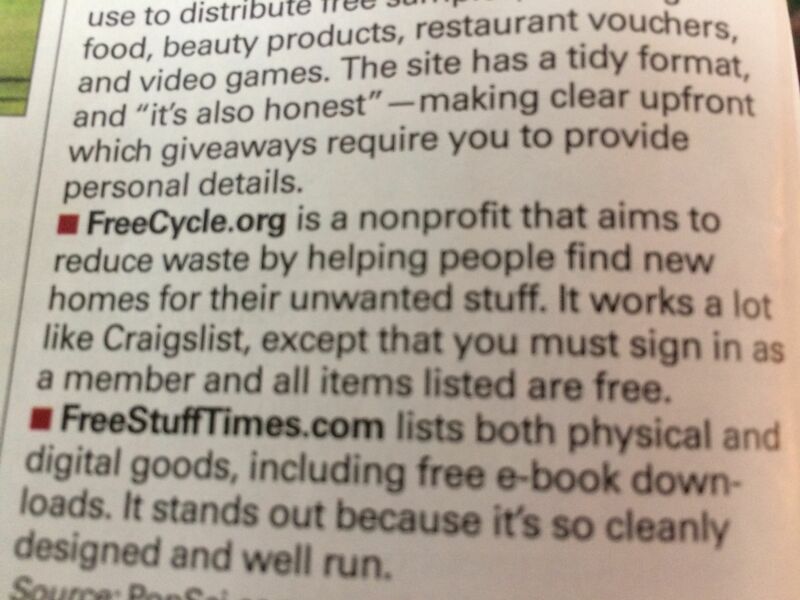 Freecycle is a website where people can offer old household items to the community for free. That way people can give them a new home, while the old owner doesn’t have to go to the dump. Many local community Facebook pages have similar functions. Picking up items off of these sites and selling them on an eBay store is a great way of making money for nothing. Anyone who received presents they didn’t want and can’t return, could consider organising a present swap with friends or relatives. They could also be swapped or sold online at freecycle.co.uk and ebay.co.uk. Unwanted presents could also be donated to a charity shop rather than just thrown out or put away, never to be used.